In this article, we report a rare case of hydatid cyst in the posterior aspect of the thigh of a 70-year-old lady from the endemic region (Yemen). She presented to the orthopedic clinic in King Abdulaziz University Hospital, Jeddah, KSA, complaining of a painless, gradually progressive swelling of the left posterior thigh. Diagnosis was reached by computed tomography scan and MRI of the left thigh, and confirmed with an ultrasound-guided fine needle aspiration. The cyst was treated with a wide excision and 3 months of albendazole. The primary intermuscular hydatid disease is a rare condition. Clinically, it presents as a painless slowly growing mass. Preoperative diagnosis is essential because cyst rupture and dissemination may lead to recurrence. The diagnosis can be obtained by computed tomography scan, MRI, and ultrasound. A fine needle aspiration may done to confirm the preoperative diagnosis. Combination of wide excision and chemotherapy in such cases is the recommended and curative treatment. Hydatid disease is a parasitic infestation caused by the cystic stage of tapeworms, Echinococcus granulosus. Humans acquire the disease by close contact with the infected animal itself or ingestion of a food that is contaminated with the animal’s feces. Hydatid disease has a worldwide distribution and cause a health problem in endemic countries, such as Middle East, Mediterranean, South America, and Australia. The disease in humans most commonly occurs in the liver and lungs, while musculoskeletal involvement is rare. It presents usually as painless slowly growing mass mimicking a soft tissue tumor. So, it should be considered in the differential diagnosis of soft tissue swelling mainly in the endemic regions. Preoperative diagnosis is essential because cyst rupture and dissemination may lead to recurrence, and fine needle aspiration may be done to confirm the preoperative diagnosis, but antiparasitic treatment is recommended to decrease anaphylaxis and contamination of the surrounding tissue. A combination of wide excision and chemotherapy is the current treatment of choice for hydatid cysts ,,,,,. In this paper, we report a rare presentation of an intermuscular hydatid cyst in the posterior aspect of the thigh. In December 2007, a 70-year-old woman presented to the orthopedic clinic in King Abdulaziz University Hospital (Jeddah, KSA) with a gradually progressive swelling in the posterior aspect of the left thigh since 12 months. The swelling was painless, but for the last 3 months it started to cause mild discomfort during walking. There was no associated fever or night sweat. Neither weight loss nor loss of appetite was observed. The patient is from Yemen (Middle East) which is considered as an endemic region of hydatid disease. Moreover, she lives in an animal farm, having daily contact with animals, for example, sheep, cattle, and dogs. On physical examination, the swelling was located in the lower posterior aspect of the left thigh, firm in consistency, mobile, nontender, nonpulsatile, and with a smooth border. It measures ∼7×4 cm in dimension. No inguinal lymphadenopathy was detected. Computed tomography (CT) scan showed a well-defined low-density multiseptated mass in the posterior aspect of the thigh, with no infiltration of any surrounding tissues or muscles. It measures 8.2×2.87×3 cm in dimension. The MRI findings have shown a well-defined, multiloculated, oblong mass, measuring 7.6×2.4×3 cm with some septation showing increased signal intensity in the proton density and T2-weighted images, and it is hypotense in T1-weighted images. It is located on the posterior and medial to the femur. It also shows the rim ([Figure 1]a and [Figure 1]b). CT scan of the chest, abdomen, and pelvis showed no evidence of hydatid disease. Laboratory tests and bone scan were unremarkable. 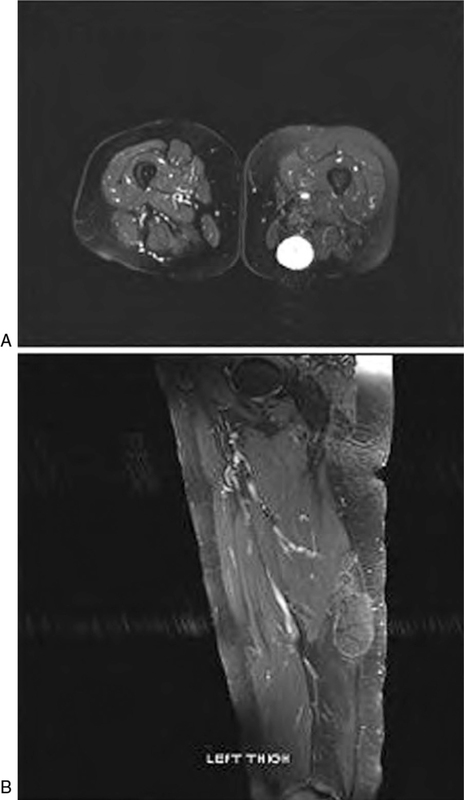 Figure 1 MRI findings showing the intermuscular hydatid cyst in the posterior aspect of the thigh: (a) axial proton density and T2-weighted MRI with high signal intensity, (b) sagittal T1-weighted MRI with low signal intensity. The infectious diseases team was consulted and recommended a fine needle aspiration, which was done and the result showed many scolices and few hooklets in a background of cyst content. This picture was consistent with hydatid cyst. Albendazole (400 mg, twice daily) was given to the patient to eliminate any possible larvae dissemination by needle aspiration. Complete excision of the cyst, including the fine needle aspiration tract and irrigation with hypertonic saline was performed through a posterior, midline incision ([Figure 2]a and [Figure 2]b). The postoperative histopathology confirmed the diagnosis of hydatid cyst. Postoperative period was uneventful. Albendazole (400 mg, twice daily) for 3 months was prescribed to the patient. Figure 2 Intraoperative pictures of the cyst: (a) pre-excision, (b) postexcision. In humans, most hydatid cysts occur in the liver (59–75%), followed by the lung (27%). The musculoskeletal involvement is rare (1–4%). Hydatid cysts seated in the soft tissue are extremely rare ,. The exceptional nature of muscle and soft tissues localization concerns diffusion of the infecting embryo; the most reliable hypothesis is that the liver and lungs can be bypassed through precapillary anastomosis between preparenchymal and postparenchymal circulation . Though the muscle environment is not a favorable site for the parasite survival because of its high lactic acid and muscle contractions which prevent fixation of larvae to the tissue, the volume of the muscle mass and its rich blood supply could explain the exceptional nature of localization in the proximal muscles of the lower limb ,. Bayram and Siriksi  reported the first intermuscular hydatid cyst in the forearm of an 18-year-old man. In 2008, Javad Mortazavi et al. published a second case of intermuscular hydatid cyst in the thigh. Then in 2010, a third case in the gluteal region was reported by Sreeramulu et al. . This article presents another rare case of intermuscular hydatid cyst located in the posterior aspect of the thigh. Hydatidosis usually presents as a slowly growing soft tissue mass, mimicking a tumor and should be considered in patients coming from endemic areas ,. Imaging methods such as MRI and CT scan are used for the diagnosis of hydatid cysts. On MRI examination, the cystic lesion shows low signal on T1-weighted images and high signal on T2-weighted images with a low signal intensity rim representing the outer pericyst. This low signal is supposed to be due to the collagenous nature of this pericyst. CT scan demonstrates a well-defined cystic lesion with daughter cysts, may contain septae in it with no enhancement on intravenous contrast ,. The preoperative diagnosis may be confirmed by fine needle aspiration. Since this procedure may carry the risk of anaphylaxis due to the leakage of cyst fluid into the surrounding tissue and circulation, antiparasitic treatment before this procedure is recommended ,. In our patient, the social history, clinical features, and radiological findings were suggestive of the diagnosis of hydatid disease. Then, it was confirmed with the fine needle aspiration picture and later with the histopathology results. The primary treatment of hydatid cysts is en block resection of the cyst without inducing rupture, which may cause anaphylactic shock and spreading of the daughter cyst, leading to local recurrence. But, a combination of wide excision and chemotherapy is effective, for example, albendazole is the current recommended treatment. This combination has been found to be more effective and curative, mainly in the restricted area, where excision of cysts without rupture is impossible ,. In our case, a combination of complete excision of the cyst, including intraoperative irrigation with hypertonic saline and albendazole to prevent recurrence, was the given treatment. Intermuscular hydatid cyst is a rare case, and should be considered in the differential diagnosis of soft tissue swelling mainly in the endemic regions, because it may mimic a soft tissue tumor leading to inappropriate cyst rupture with the attendant risks of anaphylaxis and dissemination to other parts of the body. Bedioui H, Chebbi F, Ayadi S, Daghfous A, Bakhtri M, Jouini M et al. Primary hydatid cyst of the pancreas: diagnosis and surgical procedures. Report of three cases. Gasteroenterl Clin Biol 2008; 32:106–106. Savas L, Onlen Y, Akcali C, Aslan B, Pourbagher A, Tunc T et al. Hydatid disease with atypical localization: 4 cases report. Scand J Infect Dis 2004; 36:613–615. Akosy F, Tanrikulu S, Kosar U. Inferiorly located retrobulbar hydatid cyst: CT and MRI features. Comput Med Imaging Graph 2001; 25:535. Mahesh I, Biswas J, Subramanian N. Role of ultrasound and CT-scan in diagnosis of hydatid cyst of the orbit. Orbit 2000; 19:179. Arazi M, Erikoglu M, Odev K, Memic R, Ozdemir M. Primary echinococcus of the bone and muscles. Clin Orthop Relat Res. 2005; 432:234–241. Orhan Z, Kara H, Tuzuner T, Sencan I, Alper M. Primary subcutaneous cyst hydatic disease in proximal thigh: an unusual localization: a case report. BMC Musculoskelet Disord 2003; 4:25. Verasaci A, Scuderi G, Rosato A, Angio LG, Oliva G, Sfuncia G et al. Rare localization of echinococcosis; personal experience. ANZ J Surg 2005; 75:986–991. Tatari H, Baran O, Sanlidag T, Gore O, Ak D, Manisali M et al. Primary intramuscular hydatidosis of supraspinatus muscle. Arch Orthop Trauma Surg 2001; 121:93–94. Mseddi M, Mtaoumi M, Dahmene J, Ben Hamida R, Siala A, Moula T et al. Hydatid cysts in muscles: eleven cases. Rev Chir Orthop Repartrice Appar Mot 2005; 91:267–271. Bayram M, Sirikci A. Hydatide cyst located intermuscular area of the forearm: MR imaging findings. Eur J Radiol 2000; 36:130–132. Javad Mortazafi SM, Motamedi M, Asadollahi S, Haeri H, Moghtadaee M. Primary intermuscular hydatid cyst of the thigh. Orhtopadics 2008; 31:85. Sreeramulu PN. 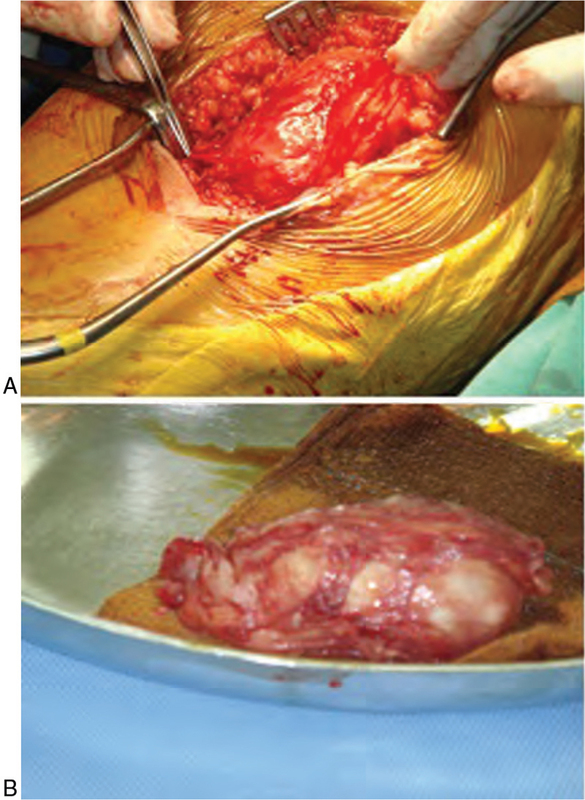 Gluteal region musculoskeltalhydatid cyst: case report and review of literature. Indian J Surg 2010; 72(Suppl 1):302–305. Pedrosa I, Salz A, Arrazola J, Ferreiros J, Pedrosa CS. Hydatid disease: radiological and pathological features and complications. Radiographics 2000; 20:795–817. Garcia-Diez AL, Ros Mendoza LH, Villacampa VM, Cozar M, Fuertes MI. MRI evaluation of soft tissue hydatid disease. Eur Radiol 2000; 10:462–466. Niscigorsca J, Sluzar T, Marczewska M, Karpinska E, Boron-kaczmarska A, Moranska I et al. Parasitic cysts of the liver- practical approach to diagnosis and differentiation. Med Sci Monit 2001; 7:737–741. Combalia A, Sastre-Solsona S. Hydatid cyst of gluteus muscle. Two cases. Review of the literature. Joint Bone Spine 2005; 72:430–432.